Booker works at the Rainier Beach branch of the Seattle Public Libray system. 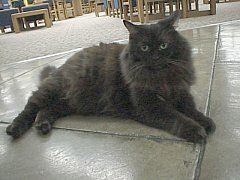 He was found on Beacon Ave. as a kitten in 1990, and brought to the library to live. He is completely spoiled; he will only eat fancy food. He likes to get into the employees lunches. Once he ate part of someone's tuna sandwich. 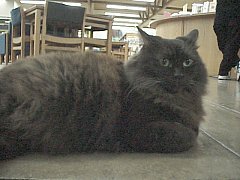 Another time when there was a party at the library, Booker jumped onto the top of a cake box to sleep. The cake inside was ruined, but the bakery fixed it up in no time. Booker likes being adored by his many fans, but does not like to be picked up. (As a result, they had to push him out on a chair to meet us and dump him off, instead of lifting him up and carrying him out to us!) He does like sitting in laps, though, and if you are sitting at a search terminal, he may invite himself up for a snooze. 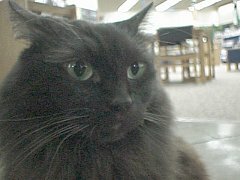 Booker died peacefully at his retirement residence in July of 2006. He was much loved and will be missed very much.